OHS teams are skilled at operating emergency shelters, such as this one in 2013. Volunteers and employees from OHS deployed this week to help care for pets displaced by Hurricane Irma. Members of the disaster response teams are trained in emergency shelter operations and in caring pets who are often frightened and fearful after being separated from their homes and families. A three-person team departed Wednesday morning for Duncan, South Carolina. See video below. Team members will help provide daily care for animals at a 40,000 square-foot temporary emergency facility established by the ASPCA. More than 500 animals affected by Hurricane Irma have been cared for at the Duncan emergency shelter so far. A fourth OHS team member arrived on Sept. 18 and is helping to transport and distribute supplies from the Duncan shelter to animal facilities in Florida that need help in the wake of Irma. 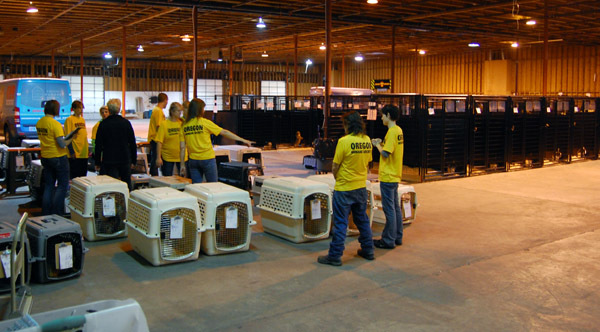 Another OHS team departed on Sept. 20 to help the Atlanta Humane Society. The Atlanta shelter is still receiving animals displaced by Hurricane Irma and needs assistance in emergency shelter operations. Two OHS employees and one volunteer headed to Atlanta on Sept. 20. Here in Portland, OHS is opening its kennels to dogs and cats displaced by the hurricanes. Next week, more than 100 pets from Texas and Florida who were displaced by the hurricanes are expected to arrive. The efforts to help Hurricane Irma relief efforts come in the wake of recent deployment of an OHS team to Houston (story here) to assist with Hurricane Harvey relief efforts. All disaster relief efforts provided by OHS are supported entirely by private donations, and receive no tax dollars. Donate here.